Sorry for the lengthy delay in posting. Two weeks ago, my children’s Godmother (and the mother to MY Godchildren) passed away unexpectedly. To say that I was shocked and saddened would be a gross understatement. Even now I have a tough time processing the fact that this wonderful person is gone from my life forever. She was one of those people that no matter how long had passed since we last talked, we always picked RIGHT up where we left off. I had spoken to her less than a month before her death and she sounded great, happy…everything I loved about her. So that is how I will remember her, not the last few days of her life and her untimely death. So I came back home from her memorial services, and back into my routine. New job, kid stuff, market runs, hit and miss dinners. HOWEVER, I was able to make Italian stuffed cabbage rolls for my family as well as an extra pan which I delivered to friends who are brand new parents. I’ll do the tutorial on those later (they were LABOR INTENSIVE but oh so good! ), but today I wanted to celebrate the most delicious, easiest side dish/salad I’ve had in a long long time. I call it “Zucchini Ribbon Salad” and it seriously couldn’t be easier. I was fortunate enough to snag some tiny yellow squash and some small zucchini from the farmer’s market, hooray for fall plantings! and I needed something delicious to do with them. So here’s my answer… warning…it’s addictive. I used four small yellow squash and two small zucchini… as well as a small red onion. I put them on the mandolin, and sliced them super thin into ribbons. I sliced the onion thin as well, and popped it into ice water to take some of the “bite” out of it. You could also use a simple vegetable peeler to get the ribbon effect from the squash, but since I had the mandolin out, I couldn’t resist! I put one large clove of garlic through the garlic press into a bowl. I added the zest of a lemon and then the juice of that lemon to the bowl. I chopped up a handful of fresh parsley, added salt, and then whisked in a generous amount of olive oil to make a lemon vinaigrette. Be sure to taste! You want it lemony, but not so tart it causes the pucker factor. I added the squash ribbons to the vinaigrette, making sure to separate them (no clumps of ribbons for me), and removed the onion from the water. I patted it dry on paper towels, and added it to the squash, then tossed everything together, mixing well and coating it with that delicious dressing. To serve, I used tongs and pulled the ribbons out, piling them loosely on the side of the plate. I topped it with some feta cheese, and it was perfect. Fresh, lemony, slightly salty from the feta… YUM. I could have eaten the entire bowl by myself. AND it was even better the next day. It ended up being a great end to a pretty crappy couple of weeks. Now I’m back and working on my next passion: Christmas shopping! But my idea for Christmas this year is to eschew the big box stores as much as I can, and either make gifts by hand, or purchase from local vendors, artisans, craftsmen, and small businesses. Yes, I know, Wally World hires people in my neighborhood, but ultimately a lot of the money goes to product manufacturers in China, and the profits to stockholder portfolios. However, by purchasing locally, the money goes in the hands of REAL people in my community. Plus these folks are putting their talent, their passion into their product…they deserve to be rewarded for that! So, this Christmas it will be pre-paid meals (or gift cards) from the locally owned restaurant, or fitness classes with the personal trainer, or handcrafted jewelry, or prints of local nature photography. Feel free to find us on Facebook and get the ball rolling in your own neighborhood! Our group is open to anyone, come shop with us, or promote your own ideas. I’d love for this to become a nationwide movement, just think of all the benefits we could bring to the economy if we all shopped small? An Outside the Box (Store) Christmas on Facebook. There are some places I should NOT be allowed to go, because I cannot control myself. Up near the top of that list would be Williams-Sonoma. It’s like crack cocaine for me. I walk in there and my brain is screaming “OHMYGODOHMYGODOHMYGODDDDDDDD LOOK AT ALL THE FUN STUFF!! !” Seriously, the cheering in my soul is impossible to ignore. So today I went to the Annapolis Mall after Boy’s soccer match, and sure as heck, ended up at my own personal crack den…I mean Williams-Sonoma. They had scads of Halloween and fall goodies set up all over the place, including the CUTEST cupcake decorating sets, stencils, sanding sugars, cookie cutters, and stuff for spooky table decor, including a whole bunch of table linens, placecard holders, and coasters all designed around Poe’s “The Raven”. I was browsing the perimeter of the store, sipping my complimentary apple cider, and I came upon an entire gluten free display of products (many of them NEW!) and I swear I squealed OUT LOUD. Pancake and waffle mix, cupcake mixes (in FLAVORS! ), and Cup4Cup Gluten-Free Flour. Now, Cup4Cup … or C4C… is featured in this month’s “Everyday with Rachel Ray” magazine and is rated the BEST gluten-free flour on the market. It isn’t cheap (I paid $22 for a big bag) but for those of you who have fought with inferior gluten-free flours and gotten cakes that won’t rise, or has a weird texture, or the taste is “off”. Also, oftentimes, recipes have to be modified for gluten-free flours since they don’t measure quite the same way as wheat flour. Not with this stuff. I cannot wait to try it. I also got cupcake mix… chocolate and red velvet. 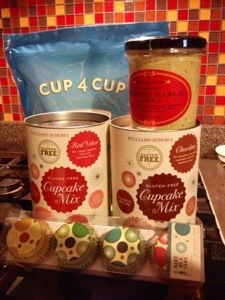 Williams-Sonoma uses C4C flour in their cupcake mix, so I have high hopes. I got some garlic aioli, and some super cute mini cupcake liners that I’m going to use in Stretch’s Halloween care package. If my phone hadn’t gone off when it did, I may STILL be in that store. Because I need help. Maybe a 12-step program for Williams-Sonoma addicts? I’ll be sure to let you all know how the cupcakes turn out. At this point, I’m so excited to make them, that MAY be what we end up having for dinner tomorrow night. The spouse will just LOVE that. Finished a few goodies to be care packaged, and tomorrow afternoon I’ll put Mads to work on the final food project. Until then, I’m off to sleep… hope your weekend is another delicious one!